How to trade manually with Forex Pulse Detector? Actually Forex Pulse Detector is an automated trading expert advisor (forex robot). But thanks to its hybrid trading system it can be used also for manual trading. The good thing is that the robot will manage the manual trades automatically. This is a very big advantage because trades management is difficult and consume a lot of time. The robot can do it for the forex traders. How to open manual trades with Forex Pulse Detector? When the robot is installed correctly and attached to a chart two buttons will be printed over the chart: BUY and SELL. By clicking the buttons BUY and SELL you can open manual trades. Both buttons can be clicked separately or at the same time. If you click BUY button then the robot will open long position. If you click SELL button then the robot will open short position. The risk from the robot settings will be used during openinig the trades. The same automated exit logic will be used for managing the mnanual trades. When to click the buttons? It is very easy to find when to click the buttons. When there is a big movement in one direction and you see that it will not continue in the same direction then juts open a trade in opposite direction. If the price has raised then open sell, if the price has fallen then open buy. There are many good indicators which you can use for manual trading. 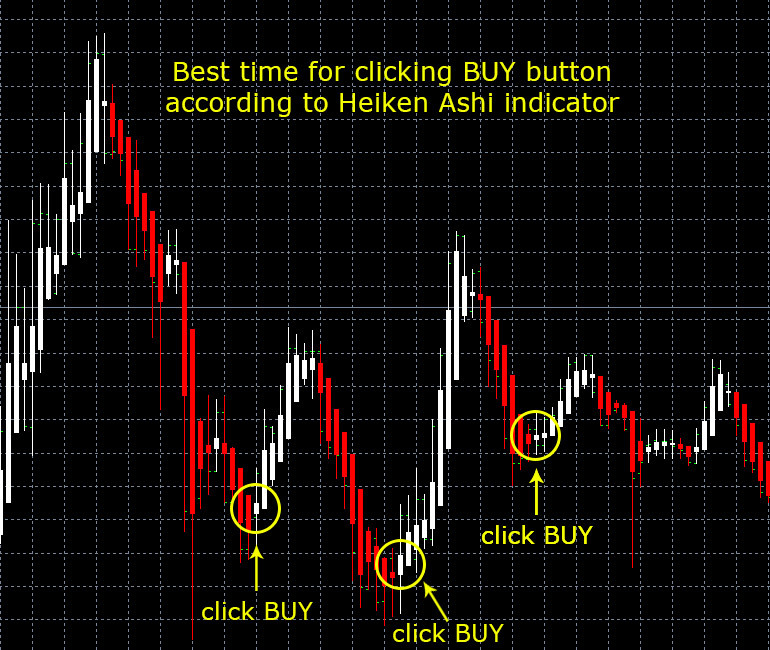 Using an additional indicator will help you to find the best moment for clicking the buttons BUY and SELL. One of these good indicators is Heiken Ashi. It is a standard indicator and available in any MT4 terminal Indicators list. Below you can find how to use it for manual trading. Please try this on a demo account before to test on a real money. You can use the robot on any currency pair you want. If the currency pair is not officially supported then the robot will work only on manual mode. The official support is for GBPUSD and EURGBP. By clicking the BUY and SELL buttons over the chart you have the freedom to make additional profits. We hope the above explanation is understandable. If you have not understood please contact us again. Thanks for the post. 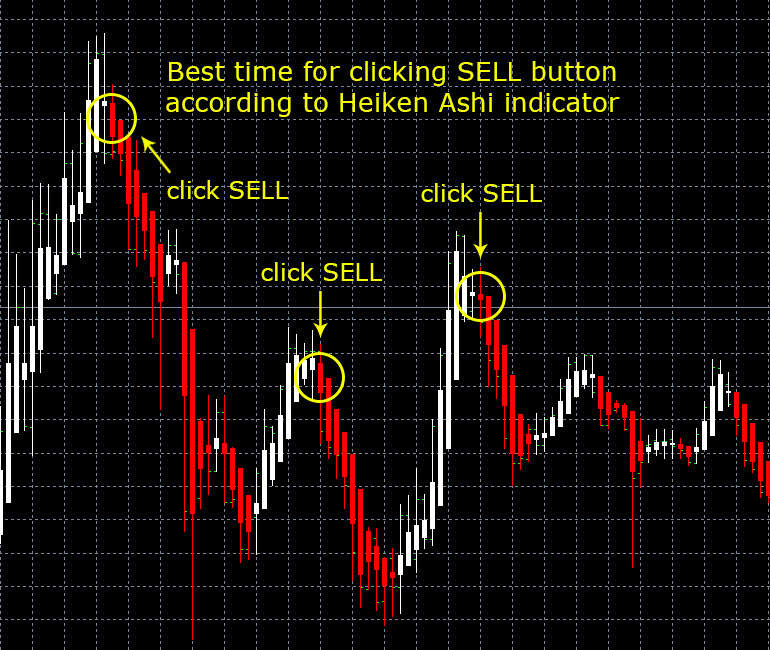 Heiken Ashi is my favorite forex indicator. It is very easy for understanding and trading with this indicator. In combination with Forex Pulse Detector i really make good profits. Ларри: Спасибо за почту. Heiken Ashi - мой любимый индикатор Форекс. Это очень легко для понимания и торговли с этим индикатором. В сочетании с Forex Pulse Detector я действительно получаю хорошую прибыль. а как вы торгуете. в ручную или робот сам автоматически??? Александр Сивеньков: Ларри: Спасибо за почту. Heiken Ashi - мой любимый индикатор Форекс. Это очень легко для понимания и торговли с этим индикатором. В сочетании с Forex Pulse Detector я действительно получаю хорошую прибыль. Actually Forex Pulse Detector is an automated forex robot but it also has a manual trading option. The robots prints 2 buttons BUY and SELL on the chart. If you click the BUY then the robot opens BUY position if you click SELL button the robot open SELL position. The best is that the robot manages the manual trades automatically. This is an amazing feature which i use and i am very happy with this because it really works and brings me some money.